Welcome back, Donist World Denizens! For those of you new to our site, I’m Donist, and I am joined by Donist World CFO the Reverse Obie (my friends’ Boston terrier whose fur recently swapped colors) and by our marketing director / administrative assistant / party planner / new beginnings consultant Tulip (my dog, Obie’s sister). As I’ve explained over the past couple FSoH/SitW posts, Obie, through his dabbling in arcane magics mixed with ancient corrupt business practices, has had not just the colors of his fur switched, but a complete overhaul of his work ethic as well…I think I’m kinda okay with the mishap. Today, Tulip and the Reverse Obie ordered in tacos and ginger ale, and saved the ol’ PowerPoint presentation on maintaining our status as a Fortune 320,000 company. They also put up the “Closed - Company Outing” sign on the corporate office (Mom’s basement) door, and we’re just going to kick it today. I’ve finished my graphic design classes, I’ve finished tutoring, and a bunch of other things are in the works. 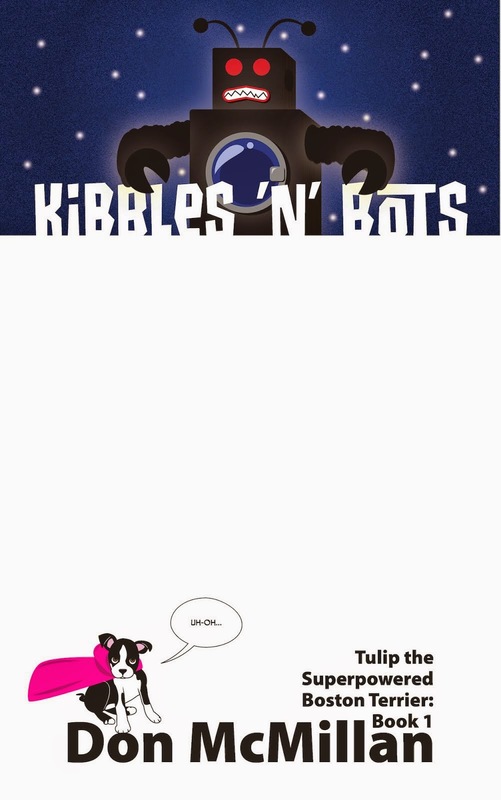 Most of all, I look forward to starting the second draft to the Kibbles ’N’ Bots (available here!!!) followup, as well as beginning development of a new YA series I want to begin writing at the beginning of 2016. So, set yourself up for some tasty treats — how about a great ginger ale? 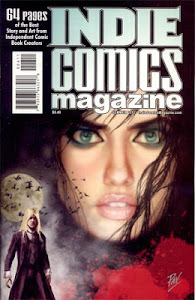 — watch the phenomenal Jessica Jones, and most of all read some great comics. Take care. Thank you for reading! The Twilight Children #3 - Written by Gilbert Hernandez, illustrated and lettered by Darwyn Cooke, colored by Dave Stewart, published by Vertigo Comics, a DC Comics imprint. Things continue to get weird in the sleepy fishing village as inhabitants vanish and tensions mount. Meanwhile, Tito’s jealousy over the strange girl with the frost-white hair escalates. No lie, Denizens, I’m still kinda as lost in issue three as I have been with the first two issues; that is sooooo okay by me. This is despite Ela actually flat out stating why she is there and alluding to what is coming. We also gain more insight into Tito and just how far she is willing to go to get her way, as well as her desperation to get out of the village. The moments with the secret agents posing as tourists are comical as everyone knows they’re secret agents…or rather it’s all funny until something terrible happens to remind the reader that not all is right in town. The vague ending did its job well by cementing my need to see how this awesome mini actually ends. As enchanting as the story is, the art…my goodness gracious…the art is gorgeous, but this should come as no surprise. Darwyn Cooke is a master of storytelling, character acting, and cartooning with his uncanny ability to pull a reader into any story regardless of the subject matter. But the way he draws the lovely Tito and Ela goes beyond talent and transcends into the heavenly; once you see a page with either of them, you will know what I mean (like this one!). Stewart’s colors turn Cooke’s already lovely art into something simply magical with his warm sunsets, cool evenings, and obnoxious Hawaiian shirts on a pair of tourists. Put it this way, if these two illustrated a refrigerator manual, I would be talking about it here on Donist World with glowing praise. With The Twilight Children, you get not just a wonderful story, but one heck of a good lookin’ book. Even better, with this third issue the abundance of story-flow-crushing ads found in the previous two issues is not a problem as DC has tremendously reduced the interruptions down to two ads, which greatly enhances the reading experience of this magical realism tale. I adore this mini-series, and although there is a hardcover collection set to arrive in May, you might not want to wait until then to experience this truly special comic. So very good. VERY HIGHLY RECOMMENDED! Rachel Rising #38 - Everythinged by Terry Moore, published by Abstract Studio. Aunt Johnny has been doing a little digging into who “murdered” Rachel; some of her findings might be the key to unlocking the resurrected girl’s memories. Meanwhile, a pair of grannies take an interest in Lilith. That’s what I’m talkin’ about! I have loved Rachel Rising ever since the beginning, and although some of the issues are paced a bit slower and some have a lowered page count, it is always a fantastic series I am excited to read. The thing about Moore is just as you become comfortable with the story, its pacing, its characters, he pulls the rug out from under you with a new revelation. Such is the case this month, and some of what Rachel discovers continues to give me the willies. No, Denizens, I ain’t gonna spoil, you just need to read this issue. The brief moments with Earl and Jet are enough to make the most hardened heart go, “Awwwwwww…,” but now after a couple issues of such tender moments, I am starting to worry about the couple. Moore’s handle on character acting is phenomenal as we see Earl asleep, his arms wrapped around Jet, who smiles with a tear in her eye before kissing the man’s arm. It is such an intimate scene, and the flat, solid wash of grey indicating it is nighttime sets the mood all the better. However, what Earl sees out the window — colored all in white — washed me in dread and left me quite worried. I don’t want anything bad to happen to these characters, but I know I will be there to witness their fate, whatever it might be, all because of Moore’s ability to make me love them dearly. Aunt Johnny…Aunt Johnny just rules. Respect. Rachel Rising is certain to be on most people’s list of top horror comics, but that is doing this compelling series a disservice. 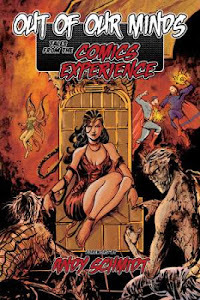 You can easily strike the word “horror” from the designation, and be gold with “top comics.” If you are not reading this Donist World Darling, then please set out immediately and pick up the first trade. I suspect the entry point will lead you quickly to the second trade and on through the sixth. Whether you read issue to issue, or trade to trade, Rachel Rising is a comic everyone should be reading. VERY HIGHLY RECOMMENDED! I have enjoyed We Stand on Guard since the beginning, but with the sixth issue, I am glad to see the mini-series wrap. It neither overstayed its welcome, nor rudely ducked out when no one was looking. Six issues was just right to tell the creators’ story, which indeed focused primarily on plot versus the characters. This is fine, but it is also the reason I never fully clicked with the series. In other hands, I might have dropped off the book after the second issue, but Vaughan’s great writing and Skroce’s beautiful art (as aided by the always phenomenal Hollingsworth’s colors) was enough to keep me coming back. I’m glad I did. Like I mentioned, I generally like character-driven stories versus those driven by plot, but this comic’s interesting premise of a futuristic (not all that far in the future, though) war between Canada and the USA was enough to keep me invested — the art was dang pretty, too. If you initially skipped this title, you should be able to scrounge up the floppies with relative ease, or you can wait for the inevitable trade that is sure to release in early 2016. RECOMMENDED! Secret Wars #8 - Written by Jonathan Hickman, illustrated by Esad Ribic, colored by Ive Svorcina, lettered by Chris Eliopoulos, produced by Idette Winecoor, published by Marvel Comics. The rule of God Doom looks to be coming to an end, as his carefully staged house of cards begins to crumble around him. Okay. This is more like it. Last issue, I had little clue as to what was going on, or what book (if any) led to which crazy thing we were witnessing on the page. Also, tons of stuff went down within the myriad tie-in series, while many characters had clearly moved on past this as-yet-unfinished mini, so, yeah, I was a bit lost. There is still some of that in this penultimate issue, but I was definitely able to follow along a bit better than in the past. That said, I feel that many groovy moments played out much too quickly: Thing vs. Franklactus, Mister Sinisters vs. everyone, Thanos and the Annihilation Horde, and Doom’s fight (ain’t spoilin’). These were all scenes that would have made the younger me — y’know, Young Donist — flip out, only to see what looked to be a grand fight extinguished all too soon. Still, the issue is exciting and I know I will be back to see how it all ends. Only issue 9 of this 8-issue mini-series remains and we will finally see if an event comic actually succeeds in causing this Donist to give a shout of joy, or pronounce an unenthused “cool,” or give a frustratingly muttered “fell for yet another cash grab.” Time will tell. If you are not reading Secret Wars, and you are waiting to see whether or not it sticks the landing before taking the plunge, then if things do work out — and they just might — then you will be able to pick up the hardcover collection at some point in March. I still like both this issue and the series enough to give them a RECOMMENDED! Donald Trump - This blowhard, spotlight hound needs to just disappear. Hopefully, more and more companies will refuse to do business with him, and send him into yet another responsibility-shirking bankruptcy. Want to drink from the fountain? Of great comics you must read?